Apply online application to RINL Recruitment 2018 72 Management Trainees. 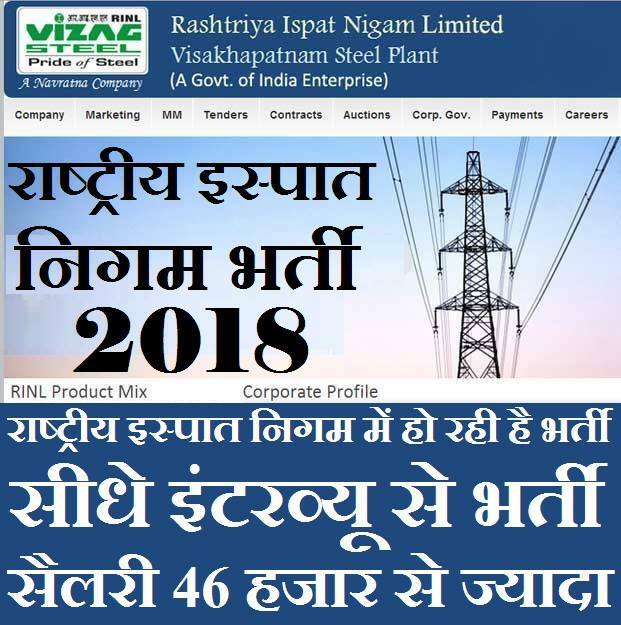 Online Rashtriya Ispat Nigam Limited (RINL) Recruitment Board, latest notification for Management Trainees. Applicants can get full advertisement below and submit the RINL online application at www.vizagsteel.com. Applicants who are going to apply, ensure RINL jobs that you are eligible for post of Management Trainees. The applicants will have to apply online, no other option. The last date of submitting online application is 14.02.2018. RINL notification further information such as eligibility criteria, syllabus and how to apply etc. listed below. Education qualification: Bachelor’s Degree in Engineering or Technology in Electrical / Mechanical / Metallurgy or its equivalent qualification from a recognized Board / University. Selection: GATE Score-2018 and Personal Interview. Age Limit: Candidates Maximum age should not exceed 27 Years As on 01.11.2017. Pay Scale- Rs.20, 600/ - Rs.46, 500/-. How to apply: Eligible applicant require to apply online through RINL Recruitment 2018 website www.vizagsteel.com from 14.02.2018. 1. Log on to the Rashtriya Ispat Nigam Limited (RINL) website www.vizagsteel.com. Applicants have great chance to get jobs Rashtriya Ispat Nigam Limited (RINL) Recruitment, however if someone want to ask anything please comment below.